As Sami’s father, I asked The Onlies if I could write a little something on their Web site regarding activities over the last two weeks, and they said yes. What follows is an attempt to convey what it’s like for an outsider like me to watch/listen to The Onlies rehearse for and record a CD. To back up a moment, I need to tell you The Onlies are recording a new CD. About a year ago, they decided to record once more while in high school, and the summer before their busy junior year was it. They wanted the experience to be educational, and to that end they hired a professional producer, Tristan Clarridge, a musical genius (and I’m not blowing smoke here—he truly is!) best known for his work as cellist with Crooked Still and The Bee Eaters. And along with Tristan, they sought a top-notch studio where they could work long hours, away from the distractions of the city. I’m writing from the control room of that studio, Paradise Sound, on a forested hill above Index, Wash., a stone’s throw from the north fork of the Skykomish River. Riley, Leo, Sami, and Tristan spent last week at a cabin just west of here on the Skykomish, courtesy of friends/fans (thank you Theresa, Tom, and Samia!). There, they practiced from 9 a.m. till midnight for four days straight, stopping briefly for meals and the occasional river dip. Surrounding two microphones, they played the tunes and songs for hours upon hours, listening to recordings of each take. With those, Tristan—gentle as a lamb, focused as a laser—coaxed them further and further, refining their arrangements, tightening their harmonies, locking in their rhythms. Tristan and The Onlies broke for the weekend, and returned to Index Sunday night. Here, they met Pat Sample, owner and sound engineer of Paradise Sound. Pat’s had a home-based studio in Index since 1984. After a flood attacked his first studio, he moved it to a hill east of town, and later built a gorgeous home immediately next to it. He’s got a guest residence down the hill, to which musicians repair after long days in the studio. Pat’s as easy-going as Tristan, and as oriented toward excellence. His control room is state-of-the-art, but he hasn’t had the heart to part with his once-state-of-the-art (circa-80s) analog tape recording deck. The main studio, walled in tenor-reverberant oak and bass-dampening cotton, is where The Onlies together have spent most of their time this week. They might have spent it separately, in any of three adjacent rooms, playing away from each other except for earphones and windows, but Tristan—seeking a groove that only physical ensemble playing can generate—wanted them playing and singing together, in the same room. Rehearsing the band for the next set of takes, Tristan focuses on one particular line, “Squint or look away, so you can't see past the fog. Settle in for the winter.” He has The Onlies and RuthMabel sing and play it over, and over, and over. And over and over and over. And over and over and over. For the perfect take. Will it come? We’ll see. Tonight, after Sami, Leo, and Riley have fallen asleep, after the recording phase has ended, Tristan will be pulling an all-nighter on his laptop, splicing the best parts of Take 8 with the best parts of other takes, and the same with the other tracks recorded this weeks. He began the editing phase earlier this week, but hasn’t completed it and hopes to do by tomorrow morning, before he treks back to California. Will he finish? We’ll see. 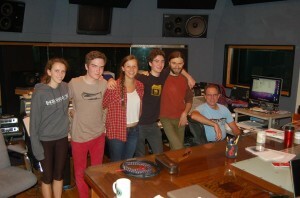 Sami, Leo, and Riley return here on Monday, to work with Pat on mixing. Mixing is the art of insuring that each recorded sound blends perfectly with all the others—that no sound dominates others, that none is lost among the others. Pat hopes they can complete at least five tracks a day—a quick pace—because after Wednesday he’s gone for a week and a half, and after that The Onlies start their junior year at Garfield. Will they finish? We’ll see. Assuming the editing and mixing phases do come to a proper conclusion, the recordings will be sent off to yet another engineer who will “master” them—mastering is the art of making sure that all the recorded cuts on the CD have roughly the same levels, that everything sounds consistently recorded and nothing sticks out like a sore thumb. All this, some time for advanced publicity and concert planning, and with a little luck, The Onlies hope to launch the new CD in early 2015. No name yet for the CD – they’re open to suggestion. Stay tuned! Previous article:Modern folk meets new jazz, Aug. 8 in Seattle! Next article:Join us in the conservation conversation! I just saw you this evening at Freight and Salvage in Berkeley at The Old Time Music Convention. YOU STOLE THE SHOW! !